“Praise him with the sounding of the trumpet, praise him with the harp and lyre, praise him with tambourine and dancing, praise him with the strings and pipe, praise him with the clash of cymbals, praise him with resounding cymbals. 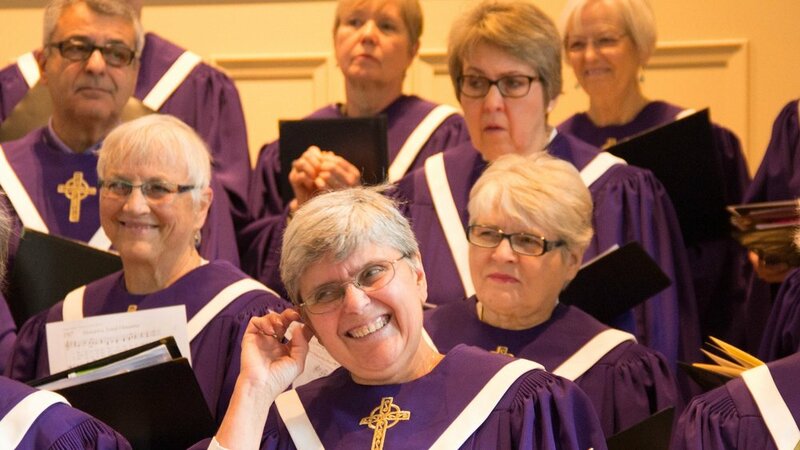 Our large adult choir is open to singers of all ages and abilities. We sing a variety of traditional and contemporary anthems for the 10:00am worship from September-May as well as for special services and concerts throughout the year. The group is often joined by guest soloists, orchestra, and instrumentalists. Dr. Jared Chase leads the choir in performing Mozart's Requiem during our Palm Sunday service. participating in the music making experience in a Handbell Choir!